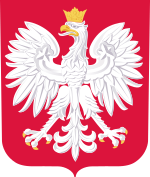 The Poland national football team (Polish : Reprezentacja Polski w piłce nożnej) represents Poland in association football and is controlled by the Polish Football Association, the governing body for football in Poland. The 2008 UEFA European Football Championship, commonly referred to as UEFA Euro 2008 or simply Euro 2008, was the 13th UEFA European Football Championship, a quadrennial football tournament contested by European nations. It took place in Austria and Switzerland from 7 to 29 June 2008. The 1992 Summer Olympic Games, officially known as the Games of the XXV Olympiad, was an international multi-sport event celebrated in Barcelona, Catalonia, Spain from July 25 to August 9, 1992. Lviv is the largest city in western Ukraine and the seventh-largest city in the country overall, with a population of around 728,350 as of 2016. Lviv is one of the main cultural centres of Ukraine. Ruch Chorzów is a Polish association football club based in Chorzów, Upper Silesia. It is one of the most successful football teams in Poland: fourteen-time national champions, and three-time winners of the Polish Cup. Currently the team plays in the Polish Third Division. Their stadium capacity is 9,300 seats. Ruch Chorzów has also had a very successful female handball team. The UEFA European Championship is the primary association football competition contested by the senior men's national teams of the members of the Union of European Football Associations (UEFA), determining the continental champion of Europe. Held every four years since 1960, in the even-numbered year between World Cup tournaments, it was originally called the UEFA European Nations' Cup, changing to the current name in 1968. 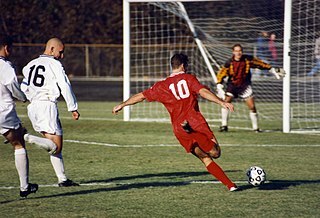 Starting with the 1996 tournament, specific championships are often referred to in the form "UEFA Euro [year]"; this format has since been retroactively applied to earlier tournaments. The Republic of Ireland national football team represents Ireland in association football. It is governed by the Football Association of Ireland (FAI) and stages its home fixtures at the Aviva Stadium in Dublin. The Andorra national football team represents Andorra in association football and is controlled by the Andorran Football Federation, the governing body for football in Andorra. The team has enjoyed very little success due to the Principality's tiny population, the fifth smallest of any UEFA country. The Slovakia national football team represents Slovakia in association football and is controlled by the Slovak Football Association (SFZ), the governing body for football in Slovakia. Slovakia's home stadium from 2019 is reconstructed Tehelné pole in capital city of Slovakia Bratislava and their head coach is Pavel Hapal. Slovakia is one of the newest national football teams in the world, having split from the Czechoslovakia national team after the dissolution of the unified state in 1993. Slovakia maintains its own national side that competes in all major professional tournaments since. The Latvia national football team represents the country in international football competitions, such as the World Cup and the European Championships. It is controlled by the Latvian Football Federation, the governing body for football in Latvia. They have never qualified for the World Cup, but they have, however, qualified for the European Championship in 2004, under Aleksandrs Starkovs. The Czech national football team represents the Czech Republic in association football and is controlled by the Football Association of the Czech Republic, the governing body for football in the Czech Republic. Historically, the team participated in FIFA and UEFA competitions as Bohemia, Austria-Hungary and Czechoslovakia, finishing second at the 1934 and 1962 World Cups and winning the European Championship in 1976. The Faroe Islands national football team, represents the Faroe Islands in association football and is controlled by the Faroe Islands Football Association. The Faroe Islands became a member of FIFA in 1988 and UEFA in 1990 and is the fourth smallest UEFA country by population. The Kazakhstan national football team represents Kazakhstan in international men's association football and is directed by Football Federation of Kazakhstan. They split from the Soviet Union national football team after independence in 1991 and joined the Asian Football Confederation's Central Asian Football Federation. After failing to qualify for the 1998 and 2002 FIFA World Cups they joined UEFA, but are yet to qualify for a FIFA World Cup or a UEFA European Championship. The Guinea-Bissau national football team is the national team of Guinea-Bissau and is controlled by the Football Federation of Guinea-Bissau. They are a member of the Confederation of African Football (CAF). Listed below are the dates and results for the 2002 FIFA World Cup qualification rounds for UEFA teams. The Montenegro national football team has represented Montenegro in association football since 2007. It is controlled by the Football Association of Montenegro, the governing body for football in Montenegro. Montenegro's home ground is Podgorica City Stadium in Podgorica. Jakub "Kuba" Błaszczykowski is a Polish professional footballer who plays as a winger for Wisła Kraków and the Poland national team. 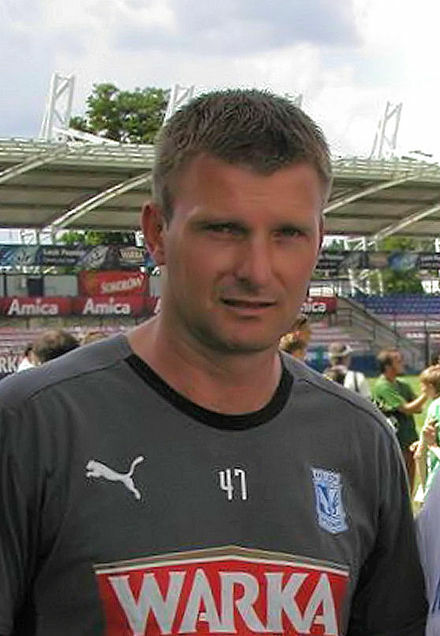 He started his professional football at Wisła Kraków establishing himself at a young age. In 2007, he joined Borussia Dortmund, where he spent the majority of his career, making over 250 appearances and winning two Bundesliga titles, two DFL-Supercups, and one DFB-Pokal. Robert Lewandowski is a Polish professional footballer who plays as a striker for Bayern Munich and is the captain of the Poland national team. Milan Badelj is a Croatian professional footballer who plays as a midfielder for Lazio and the Croatia national team. He is a member of the Croatian squad which finished as runners-up to France in 2018 FIFA World Cup. The Russia national football team represents Russia in association football and is controlled by the Russian Football Union, the governing body for football in Russia. Russia is a member of UEFA, they won the first edition of the respective continental competition in 1960 as the Soviet Union. Poland has participated in three UEFA European Championships so far: UEFA Euro 2008, UEFA Euro 2012 and UEFA Euro 2016. ↑ "The FIFA/Coca-Cola World Ranking". FIFA. 4 April 2019. Retrieved 4 April 2019. ↑ Elo rankings change compared to one year ago. "World Football Elo Ratings". eloratings.net. 27 March 2019. Retrieved 27 March 2019. ↑ "Elo ratings as on September 10th, 1975". international-football.net. ↑ ""Banda czworga", czyli afera na Okęciu" . Retrieved 9 July 2018. 1 2 FIFA.com. "1982 FIFA World Cup Spain ™ - Groups - FIFA.com". FIFA.com. Retrieved 9 July 2018. ↑ FIFA.com. "1982 FIFA World Cup Spain ™ - Matches - Italy-Poland - FIFA.com". FIFA.com. Retrieved 9 July 2018. ↑ FIFA.com. "1982 FIFA World Cup Spain ™ - Matches - Poland-Cameroon - FIFA.com". FIFA.com. Retrieved 9 July 2018. ↑ FIFA.com. "1982 FIFA World Cup Spain ™ - Matches - Poland-Peru - FIFA.com". FIFA.com. Retrieved 9 July 2018. ↑ FIFA.com. "1982 FIFA World Cup Spain ™ - Matches - Poland-Belgium - FIFA.com". FIFA.com. Retrieved 9 July 2018. ↑ FIFA.com. "1982 FIFA World Cup Spain ™ - Matches - Poland-Soviet Union - FIFA.com". FIFA.com. Retrieved 9 July 2018. ↑ Alsos, Jan. "Planet World Cup - 1982 - Semifinal - Italy v Poland". www.planetworldcup.com. Retrieved 9 July 2018. ↑ Alsos, Jan. "Planet World Cup - 1982 - 3rd/4th Place Play-Off - Poland v France". www.planetworldcup.com. Retrieved 9 July 2018. ↑ "World Cup 1986 qualifications". www.rsssf.com. Retrieved 9 July 2018. ↑ "WORLD CUP 1986". www.allworldcup.narod.ru. Retrieved 9 July 2018. ↑ FIFA.com. "1986 FIFA World Cup Mexico ™ - Groups - FIFA.com". FIFA.com. Retrieved 9 July 2018. ↑ FIFA.com. "1986 FIFA World Cup Mexico ™ - Matches - Morocco-Poland - FIFA.com". FIFA.com. Retrieved 9 July 2018. ↑ Alsos, Jan. "Planet World Cup - 1986 - Group F - Poland v Portugal". www.planetworldcup.com. Retrieved 9 July 2018. ↑ FIFA.com. "1986 FIFA World Cup Mexico ™ - Matches - England-Poland - FIFA.com". FIFA.com. Retrieved 9 July 2018. ↑ FIFA.com. "1986 FIFA World Cup Mexico ™ - Matches - Portugal-Morocco - FIFA.com". FIFA.com. Retrieved 9 July 2018. ↑ FIFA.com. "1986 FIFA World Cup Mexico ™ - Matches - Brazil-Poland - FIFA.com". FIFA.com. Retrieved 9 July 2018. ↑ FIFA.com. "1990 FIFA World Cup Italy ™ - Groups - FIFA.com". FIFA.com. Retrieved 7 July 2018. ↑ "WORLD CUP 1990". allworldcup.narod.ru. Retrieved 7 July 2018. ↑ "World Cup 1994 qualifications". 11 May 2011. Retrieved 7 July 2018. ↑ "World Cup 1994 QUALIFYING". allworldcup.narod.ru. Retrieved 7 July 2018. ↑ uefa.com. "UEFA EURO 1996 - History - Standings – UEFA.com". UEFA.com. Retrieved 7 July 2018. ↑ uefa.com. "UEFA EURO 1996 - History - Israel-Poland – UEFA.com". Uefa.com. Retrieved 7 July 2018. ↑ uefa.com. "UEFA EURO 1996 - History - Poland-Azerbaijan – UEFA.com". Uefa.com. Retrieved 7 July 2018. ↑ uefa.com. "UEFA EURO 1996 - History - Poland-France – UEFA.com". Uefa.com. Retrieved 7 July 2018. ↑ uefa.com. "UEFA EURO 1996 - History - Romania-Poland – UEFA.com". Uefa.com. Retrieved 7 July 2018. ↑ uefa.com. "UEFA EURO 1996 - History - Poland-Israel – UEFA.com". Uefa.com. Retrieved 7 July 2018. ↑ uefa.com. "UEFA EURO 1996 - History - Poland-Slovakia – UEFA.com". Uefa.com. Retrieved 7 July 2018. ↑ uefa.com. "UEFA EURO 1996 - History - France-Poland – UEFA.com". Uefa.com. Retrieved 7 July 2018. ↑ uefa.com. "UEFA EURO 1996 - History - Slovakia-Poland – UEFA.com". Uefa.com. Retrieved 7 July 2018. ↑ uefa.com. "UEFA EURO 1996 - History - Azerbaijan-Poland – UEFA.com". Uefa.com. Retrieved 7 July 2018. ↑ "World Cup 1998 qualifications". www.rsssf.com. Retrieved 7 July 2018. ↑ "UEFA - 1998 FIFA WORLD CUP PRELIMINARIES". allworldcup.narod.ru. Retrieved 7 July 2018. ↑ "Moldova national football team lost to Poland 0:3, 7 October 1997". eu-football.info. Retrieved 7 July 2018. ↑ "Georgia national football team defeated Poland 3:0, 11 October 1997". eu-football.info. Retrieved 7 July 2018. ↑ "2002 FIFA World Cup Korea/Japan ™ - Groups". FIFA.com. Fédération Internationale de Football Association. Retrieved 6 July 2018. ↑ "Poland v Armenia, 28 March 2001". 11v11.com. Retrieved 6 July 2018. ↑ "Belarus v Poland, 5 September 2001". 11v11.com. Retrieved 6 July 2018. 1 2 "2002 FIFA World Cup Korea/Japan - Groups". FIFA.com. Fédération Internationale de Football Association. Retrieved 6 July 2018. ↑ "2002 FIFA World Cup Korea/Japan - Matches - Korea Republic-Poland". FIFA.com. Fédération Internationale de Football Association. Retrieved 6 July 2018. ↑ "2002 FIFA World Cup Korea/Japan - Matches - Portugal-Poland". FIFA.com. Fédération Internationale de Football Association. Retrieved 6 July 2018. ↑ "2002 FIFA World Cup Korea/Japan - Matches - Poland-USA". FIFA.com. Fédération Internationale de Football Association. Retrieved 6 July 2018. 1 2 "2006 FIFA World Cup Germany - Groups". FIFA.com. Fédération Internationale de Football Association. Retrieved 6 July 2018. ↑ "World Cup (Sky Sports)". skysports.com. Retrieved 6 July 2018. ↑ "2006 FIFA World Cup Germany™". 4 February 2009. Retrieved 6 July 2018. ↑ Glendenning, Barry (8 September 2004). "Poland 1 - 2 England". theguardian.com. Guardian News and Media Limited. Retrieved 6 July 2018. ↑ "England 2-1 Poland". bbc.co.uk. British Broadcasting Corporation. 12 October 2005. Retrieved 6 July 2018. ↑ "2006 FIFA World Cup Germany - Groups". FIFA.com. Fédération Internationale de Football Association. Retrieved 6 July 2018. ↑ (www.dw.com), Deutsche Welle. "South American Surprise Puts Ecuador Even With Germany | DW | 9 June 2006". DW.COM. Retrieved 6 July 2018. ↑ "Germany 1-0 Poland". 14 June 2006. Retrieved 6 July 2018. ↑ "Ecuador 3-0 Costa Rica". bbc.co.uk. British Broadcasting Corporation. 15 June 2006. Retrieved 6 July 2018. ↑ "2018 FIFA World Cup Russia™ - News - COSTA RICA 1-2 POLAND". FIFA.com. Fédération Internationale de Football Association. Retrieved 6 July 2018. ↑ "Costa Rica 1-2 Poland". bbc.co.uk. British Broadcasting Corporation. 20 June 2006. Retrieved 6 July 2018. ↑ uefa.com. "UEFA EURO 2008 - History - Standings – UEFA.com". UEFA.com. Retrieved 6 July 2018. ↑ uefa.com. "UEFA EURO 2008 - History - Poland-Finland – UEFA.com". Uefa.com. Retrieved 6 July 2018. ↑ uefa.com. "UEFA EURO 2008 - History - Poland-Serbia – UEFA.com". Uefa.com. Retrieved 6 July 2018. ↑ uefa.com (7 October 2006). "UEFA EURO 2008 - History - Kazakhstan-Poland – UEFA.com". Uefa.com. Retrieved 6 July 2018. ↑ uefa.com. "UEFA EURO 2008 - History - Poland-Portugal – UEFA.com". Uefa.com. Retrieved 6 July 2018. ↑ uefa.com. "UEFA EURO 2008 - History - Belgium-Poland – UEFA.com". Uefa.com. Retrieved 6 July 2018. ↑ uefa.com. "UEFA EURO 2008 - History - Poland-Azerbaijan – UEFA.com". Uefa.com. Retrieved 6 July 2018. ↑ uefa.com. "UEFA EURO 2008 - History - Poland-Armenia – UEFA.com". Uefa.com. Retrieved 6 July 2018. ↑ uefa.com. "UEFA EURO 2008 - History - Azerbaijan-Poland – UEFA.com". Uefa.com. Retrieved 6 July 2018. ↑ uefa.com. "UEFA EURO 2008 - History - Armenia-Poland – UEFA.com". Uefa.com. Retrieved 6 July 2018. ↑ uefa.com. "UEFA EURO 2008 - History - Portugal-Poland – UEFA.com". Uefa.com. Retrieved 6 July 2018. ↑ uefa.com. "UEFA EURO 2008 - History - Finland-Poland – UEFA.com". Uefa.com. Retrieved 6 July 2018. ↑ uefa.com. "UEFA EURO 2008 - History - Poland-Kazakhstan – UEFA.com". Uefa.com. Retrieved 6 July 2018. ↑ uefa.com. "UEFA EURO 2008 - History - Poland-Belgium – UEFA.com". Uefa.com. Retrieved 6 July 2018. ↑ uefa.com. "UEFA EURO 2008 - History - Serbia-Poland – UEFA.com". Uefa.com. Retrieved 6 July 2018. ↑ uefa.com. "UEFA EURO 2008 - History - Portugal-Finland – UEFA.com". Uefa.com. Retrieved 6 July 2018. ↑ uefa.com (8 June 2008). "UEFA EURO 2008 - History - Germany-Poland – UEFA.com". Uefa.com. Retrieved 6 July 2018. ↑ "Austria 1-1 Poland". 12 June 2008. Retrieved 6 July 2018. ↑ uefa.com (12 June 2008). "UEFA EURO 2008 - History - Austria-Poland – UEFA.com". Uefa.com. Retrieved 6 July 2018. ↑ "Poland 0-1 Croatia". 16 June 2008. Retrieved 6 July 2018. ↑ FIFA.com. "2010 FIFA World Cup South Africa™ - Groups - FIFA.com". FIFA.com. Retrieved 5 July 2018. ↑ FIFA.com. "2010 FIFA World Cup South Africa™ - Matches - Poland-Slovenia - FIFA.com". FIFA.com. Retrieved 5 July 2018. ↑ FIFA.com. "2010 FIFA World Cup South Africa™ - Matches - San Marino-Poland - FIFA.com". FIFA.com. Retrieved 5 July 2018. ↑ FIFA.com. "2010 FIFA World Cup South Africa™ - Matches - Poland-Czech Republic - FIFA.com". FIFA.com. Retrieved 5 July 2018. ↑ FIFA.com. "2014 FIFA World Cup Brazil™: Slovakia-Poland - Report - FIFA.com". FIFA.com. Retrieved 5 July 2018. ↑ FIFA.com. "2010 FIFA World Cup South Africa™ - Matches - Northern Ireland-Poland - FIFA.com". FIFA.com. Retrieved 5 July 2018. ↑ Mole, Giles (2 April 2009). "European World Cup qualifying round-up: Poland put 10 past woeful San Marino". ISSN 0307-1235 . Retrieved 5 July 2018. ↑ FIFA.com. "2010 FIFA World Cup South Africa™ - Matches - Poland-San Marino - FIFA.com". FIFA.com. Retrieved 5 July 2018. ↑ FIFA.com. "2010 FIFA World Cup South Africa™ - Matches - Poland-Northern Ireland - FIFA.com". FIFA.com. Retrieved 5 July 2018. ↑ FIFA.com. "2010 FIFA World Cup South Africa™ - Matches - Slovenia-Poland - FIFA.com". FIFA.com. Retrieved 5 July 2018. ↑ FIFA.com. "2010 FIFA World Cup South Africa™ - Matches - Czech Republic-Poland - FIFA.com". FIFA.com. Retrieved 5 July 2018. ↑ FIFA.com. "2010 FIFA World Cup South Africa™ - Matches - Poland-Slovakia - FIFA.com". FIFA.com. Retrieved 5 July 2018. 1 2 uefa.com. "UEFA EURO 2012 - History - Standings – UEFA.com". UEFA.com. Retrieved 5 July 2018. ↑ "Poland 1-1 Greece". BBC Sport. 8 June 2012. Retrieved 5 July 2018. ↑ uefa.com (8 June 2012). "UEFA EURO 2012 - History - Poland-Greece – UEFA.com". Uefa.com. Retrieved 5 July 2018. ↑ uefa.com (12 June 2012). "UEFA EURO 2012 - History - Poland-Russia – UEFA.com". Uefa.com. Retrieved 5 July 2018. ↑ Wilson, Paul (12 June 2012). "Euro 2012: Poland 1-1 Russia | Group A match report". the Guardian. Retrieved 5 July 2018. ↑ "Czech Republic 1-0 Poland". BBC Sport. 16 June 2012. Retrieved 5 July 2018. ↑ Hytner, David (16 June 2012). "Czech Republic 1-0 Poland | Euro 2012 match report". the Guardian. Retrieved 5 July 2018. ↑ FIFA.com. "2014 FIFA World Cup Brazil™ - Groups - FIFA.com". FIFA.com. Retrieved 5 July 2018. ↑ FIFA.com. "2014 FIFA World Cup Brazil™: Montenegro-Poland - Report - FIFA.com". FIFA.com. Retrieved 5 July 2018. ↑ FIFA.com. "2014 FIFA World Cup Brazil™: Poland-Moldova - Report - FIFA.com". FIFA.com. Retrieved 5 July 2018. ↑ FIFA.com. "2014 FIFA World Cup Brazil™: Poland-England - Report - FIFA.com". FIFA.com. Retrieved 5 July 2018. ↑ FIFA.com. "2014 FIFA World Cup Brazil™: Poland-Ukraine - Report - FIFA.com". FIFA.com. Retrieved 5 July 2018. ↑ FIFA.com. "2014 FIFA World Cup Brazil™: Poland-San Marino - Report - FIFA.com". FIFA.com. Retrieved 5 July 2018. ↑ FIFA.com. "2014 FIFA World Cup Brazil™: Poland-Montenegro - Report - FIFA.com". FIFA.com. Retrieved 5 July 2018. ↑ FIFA.com. "2014 FIFA World Cup Brazil™ - Matches - San Marino-Poland - FIFA.com". FIFA.com. Retrieved 5 July 2018. ↑ FIFA.com. "2014 FIFA World Cup Brazil™: Ukraine-Poland - Report - FIFA.com". FIFA.com. Retrieved 5 July 2018. ↑ FIFA.com. "2014 FIFA World Cup Brazil™: England-Poland - Report - FIFA.com". FIFA.com. Retrieved 5 July 2018. ↑ "England 2-0 Poland". BBC Sport. 15 October 2013. Retrieved 5 July 2018. ↑ uefa.com. "UEFA EURO 2016 - History - Standings – UEFA.com". UEFA.com. Retrieved 5 July 2018. ↑ "Highlights: Poland win 7-0 against Gibraltar whose starting XI had only two professional footballers". 8 September 2014. Retrieved 5 July 2018. ↑ Sport, Telegraph (7 September 2014). "Gibraltar rocked by Poland as they slump to 7-0 rout in first competitive match". ISSN 0307-1235 . Retrieved 5 July 2018. ↑ Association, Press (7 September 2014). "Gibraltar 0-7 Poland | Euro 2016 Group D match report". the Guardian. Retrieved 5 July 2018. ↑ "Poland 2-0 Germany". BBC Sport. 11 October 2014. Retrieved 5 July 2018. ↑ "Poland 2-2 Scotland". BBC Sport. 14 October 2014. Retrieved 5 July 2018. ↑ uefa.com (14 November 2014). "UEFA EURO 2016 - History - Georgia-Poland – UEFA.com". Uefa.com. Retrieved 5 July 2018. ↑ "Euro 2016 Group D qualifier: Republic of Ireland 1-1 Poland". BBC Sport. 29 March 2015. Retrieved 5 July 2018. ↑ "Poland 4-0 Georgia: Hat-trick from Lewandowski sends his side top". Mail Online. Retrieved 5 July 2018. ↑ uefa.com (7 September 2015). "UEFA EURO 2016 - History - Poland-Gibraltar – UEFA.com". Uefa.com. Retrieved 5 July 2018. ↑ "Scotland 2-2 Poland". BBC Sport. 8 October 2015. Retrieved 5 July 2018. ↑ "Euro 2016 qualifiers: Poland 2-1 Republic of Ireland". BBC Sport. 11 October 2015. Retrieved 5 July 2018. ↑ "Poland 1-0 Northern Ireland". BBC Sport. 12 June 2016. Retrieved 5 July 2018. ↑ "Germany 0-0 Poland". BBC Sport. 16 June 2016. Retrieved 5 July 2018. ↑ "Ukraine 0-1 Poland". BBC Sport. 21 June 2016. Retrieved 5 July 2018.